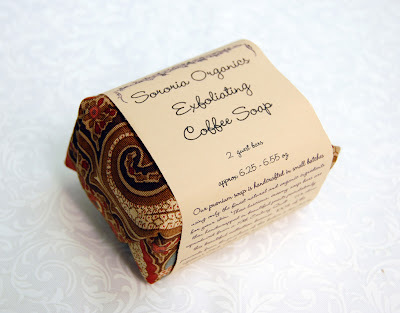 I wanted to post about these soaps before the Holidays in case you needed them as gifts, but…. I guess there is always mother’s day, birthdays or just because. First about the fabric, Collection for a Cause is an ongoing program begun by owner, Howard Marcus Dunn. It features antique quilts from his collection and support charities and causes that touch the hearts and lives of all of us. Proceeds from this collection, Heritage, will be donated to Gilda’ s Club, which seeks to provide an emotional and social support community for people living with cancer. The proceeds were given in memory of our colleague, Pam Wieland. Then I saw this. Joyce Noerr from Sororia Organics Soaps makes and packages some of her products in Heritage fabrics. Good for your skin and good for the soul…..Plus they are also giving a portion of the proceed’s to Gilda’s Club. Moda fabric, organic soap and giving back all in one thing, what could be better. Way to go, Joyce. What a lovely way to package the soaps! I was just wondering how the quilt is coming. I realize you are super busy…I’m just excited, so it thought I’d drop you a line…Thanks again! Wowza!! 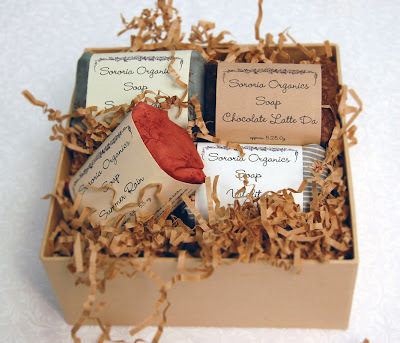 Thanks for the link of some terrific soaps and perfect gift for my forum galfriend!! We always make it a point to meet up. She doesn’t quilt, so she thinks I’m “amazing” – great for the ego to have those types of friends!! Have to take her something along with a laugh!! Enjoy reading your blog!